Clinitest is NOT back in stock. Look around online. The instruction sheet is available here as a pdf. You will need: 1 box of 36 Clinitest tabs with new color chart that is IN THE BOX, two 1 ml syringe, graduated, and two test tube 16X100. 2 for when you break the first one. Wine sample size is 0.5 ml. TThe ACCUVIN Residual Sugar Kit tests only for fructose and glucose sugars, the sugars reduced in primary fermentation. Reducing sugars in wine consist of hexoses (mainly glucose and fructose) and pentoses (mainly arabinose and xylose). The pentoses are not fermentable by wine yeasts. Since pentoses alone can vary from 0.4 - 2.0 g/L, the best measure of primary fermentation is the determination of glucose and fructose. The test range is 100 - 2,000 mg/L. The Accuvin Residual Sugar Test Kit includes 10 tests in a black barrier tube with a color chart label, 20 samplers, and illustrated complete how-to-run test instructions. The insert includes a summary Interpretation explaining how to use the test results. A monitoring chart is included. The label with another color chart is on the front of the kit. Protect your color chart from sunlight to prevent fading. 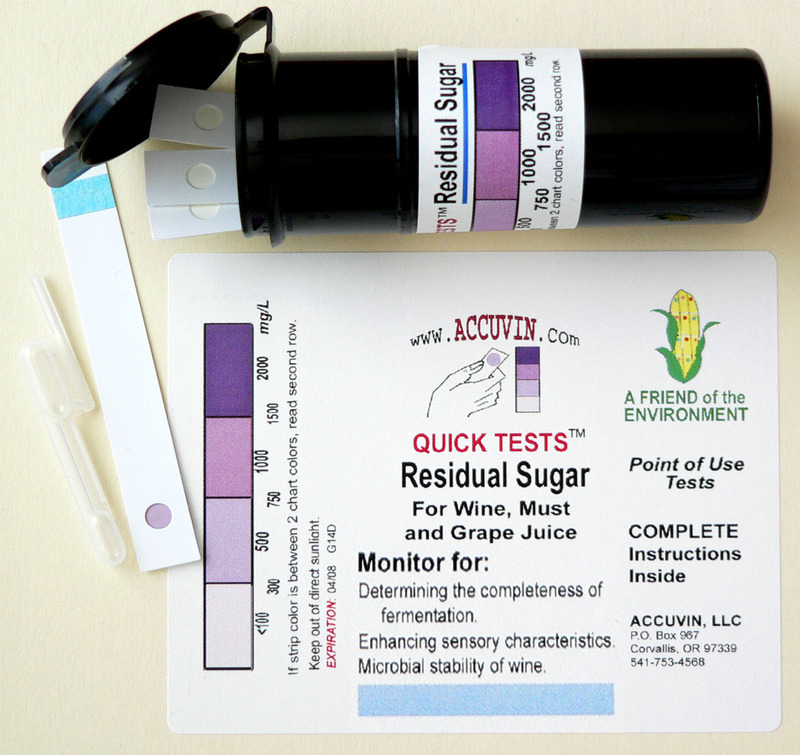 Accuvin Residual Sugar test kit is easy to use. It is targeted for drier wines than the Clinitest tablets. With the Accuvin test kit you can actually tell if your wine is bone dry. Clinitest tablets never went to zero due to reactions with non-fermentable pentoses, and from some other interfering substances. However, for winemakers who want and have some remaining residual sugar, the wine sample can be diluted 1:10 to keep it in the range of the tests. The person running the test can do the simple 1:10 dilution using distilled water. A 1:10 dilution is 1 part of sample plus 9 parts of diluent. In this way the test solution is one tenth as strong and you would multiply any answer you observed by 10 to get the concentration in the original sample. The same with a 1:20 dilution: 1 part sample and 19 parts distilled water or commercial diluent.